Your comfort is our business! 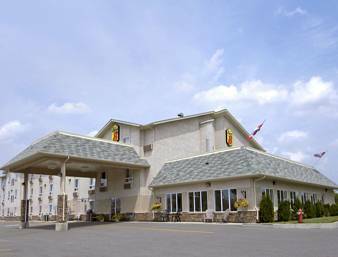 At Super 8 Fort Frances we go the distance to ensure your stay is a great one. Welcoming you with warm cookies and a hot cup of coffee Settle in for the night in one of our queen or king rooms. Traveling with the family , you may enjoy one of our 2 room suites Need extra business space, how about our executive suite Bring your someone special and enjoy a quiet evening in our hottub suite relaxing in front of the fireplace. DVD players are available for you to watch that movie you have the time to do. Relax in our hot tub or try our steam bath, the kids will enjoy a swim in our pool. Enjoy a relaxed morning with our upgraded breakfast. Can't leave that loved pet at home, bring it along $10.00 charge applies, some restrictions may apply. Are you a fitness buff.. complimentary passes available to Energy Fitness located next door. How about a round of golf, 2 beautiful courses to choose from check our great waterfront along the Rainy Lake Boston Pizza now open next door! ~16 miles from Fort Frances. ~34 miles from Fort Frances. ~47 miles from Fort Frances.